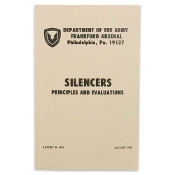 This manual presents physical and functional descriptions and evaluation of various domestic and foreign silencers and silenced small arm weapons. Included are cross sectional drawings and external view photographs of all the systems tested. An evaluation of each system is given in the form of far field sound pressure time records. This manual also presents a record of silencing principles and a theoretical analysis of the various noise generating phenomenon. 205 Pages; 5.25" x 8.5"